No, this isn’t a new album from the band: Cyanide Interactive’s Styx: Master of Shadows is officially available today, and to celebrate, there’s even a brand-new launch trailer. We’ve covered Styx: Master of Shadows no less than three times before here at MXDWN Games. Sadly, unless something extraordinary happens this is likely the last we will see of our little goblin friend, since as of today Styx and his tower-ascension stealth-action goodness are officially released to the world at large. Good bye, Styx! And good luck! But wait! Before we depart from our friend, we have one last piece of hot-off-the-presses media to share: the official Styx: Master of Shadows launch trailer. 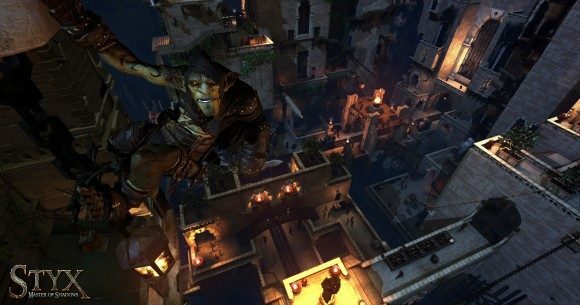 In case you haven’t heard about it already and have read this far down anyway Styx: Master of Shadows is a stealth-em-up where you play a goblin named Styx. The first and oldest of his kind, Styx is desperate to know his own origins, and the only clues he has to those origins are vague snippets of memory and visions that tell him the answer lies atop The Tower of Akenash. The tower is one of the richest locations in the realm, giving Styx plenty of opportunities to help himself to a little wealth along the way as he tries to find the answers to his own personal question of life, the universe, and everything. The fact the tower also happens to be filled with hundreds of beings who would like to see Styx floating face-down in a river somewhere is only a minor detail. As of October 7, 2014 Styx: Master of Shadows is available on PC via Steam, Xbox One, and the mighty PlayStation 4. The game officially unlocks at noon, so expect reviews to start poking their heads out soon after. All of us here at MXDWN games are excited for it… are you?